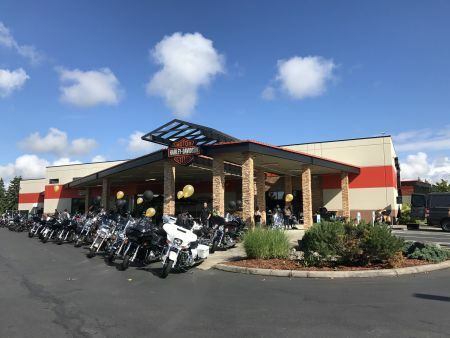 Northwest Harley-Davidson® motto reads, "The Friendliest Shop on the West Coast" and while it's easy to shrug that off as a tag line or gimmick, our owners and staff take it very seriously. "It's our home - we are here a lot - and we want people to feel welcome when they come into our home," shares shop owners Julio Valdenegro and Joe Deck. And while many Harley® shops might feel intimidating - tough, cold, full of chrome and leather - Northwest Harley-Davidson® feels far from it. Another marker of our warm and friendly atmosphere is the longevity of our staff. "We have team members who have been with us since this facility relocated in 2003 and before - some have left and come back. And for retail, that's especially long," explains the Julio and Joe. "But at our roots, Northwest Harley-Davidson® is about the bikes. We keep our focus on providing quality new and pre-owned motorcycles, an outstanding parts and service department full of knowledgeable technicians. We also take pride in hosting and sponsoring quality events that bring riders together, after all, Harley® riders are a kind of family, there is a bond between those who ride that crosses age and demographics. We love that they all can come together here" explains Julio. If you have never visited Northwest Harley-Davidson®, Julio and Joe invite you to swing on by. Even for those who've never ventured near a Harley-Davidson®motorcycle, the shop is a fun, inviting place where you can get up close to do a little fun browsing, or grab a coffee to go. You may not go home on a bike, but you're sure to go home with a smile!